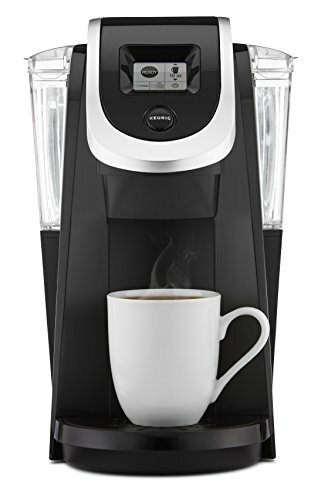 After testing and reviewing over 83 single serve coffee maker models, and after having consumed a lot of coffee, we have concluded that the Keurig K250 Single Serve is the best single serve coffee maker on the market. This coffee maker brews some very delicious coffee at a rapid speed. It’s also extremely compact and super simple to use. As the name suggests, “single serve” coffee makers are great for the user who wants a delicious cup of coffee without having to exert much effort. It’s perfect in the rush, as the maker will quickly brew a cup of coffee on autopilot. It’s a common misconception that coffee makers are only made for singles and couples. As it’s also a great choice if you’re a family of 4, as it won’t take more than a few minutes to brew one cup of coffee. However, if you’re a coffee loving family you should probably consider a standard coffee maker or a drip coffee maker. We’ve spent several weeks testing and reviewing these coffee makers. We’ve then ranked the best of them from 1 to 5. Our in-depth reviews will quickly help you narrow down your options, and help you decide which single serve coffee maker fits your needs. So, grab yourself a cup of coffee, and let’s dig straight into it. FAST. That’s what this coffee maker is. Once it’s preheated it will brew a cup of coffee in about 50 seconds. It supports different cup sizes ranging from a standard cup to a carafe, which is a decent feature made possible by its built-in scanner. The K250 is simple to use as all you have to do is select the brew size and then press the “BREW” button. The maker also features the smart Keurig brewing technology that reads the lid of each K-Cup pod so that it brews perfectly each time. The limit of this coffee maker is that you must insert K-cup pods into it. And they must be manufactured by Keurig. But for most people that should not be a problem as Keurig produces over 500 different variants. However, the delicious coffee that this coffee maker brews isn’t outmatched by any other model, which is a big plus. Even though the coffee maker is rather minimalistic and compact it is still very durable, but we’ve heard from some unfortunate coffee fanatics that it’s hard to get support from Keurig in the unfortunate event that your K250 breaks. But overall this coffee maker is a complete beast as it brews some of the best coffee at some of the fastest speeds we’ve ever seen. Very fast brewing (50 seconds). Only supports K-cups manufactured by Keurig. Not the best warranty & support. 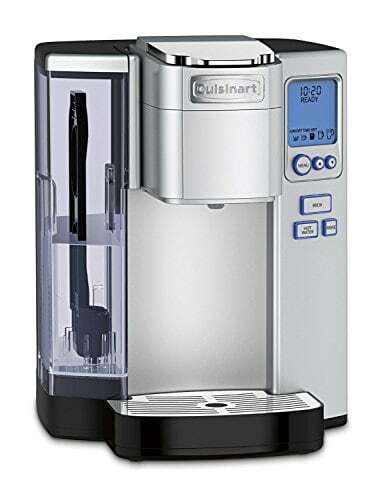 Coming in as number 2, the Cuisinart SS-10 Premium also does a great job. It’s a lot bigger which is because it has a lot of capacity for multiple pods water, which means that you won’t have to refill the coffee maker all the time, thus making it a great option if you’re a coffee loving family. This product comes with a cool, unique feature: It can be cleaned on the inside by just the click of a button. We tested this feature several times, and it works wonders. This feature will end up saving you a lot of time in the long run. As with many other single serve coffee makers, it’s extremely easy to use. 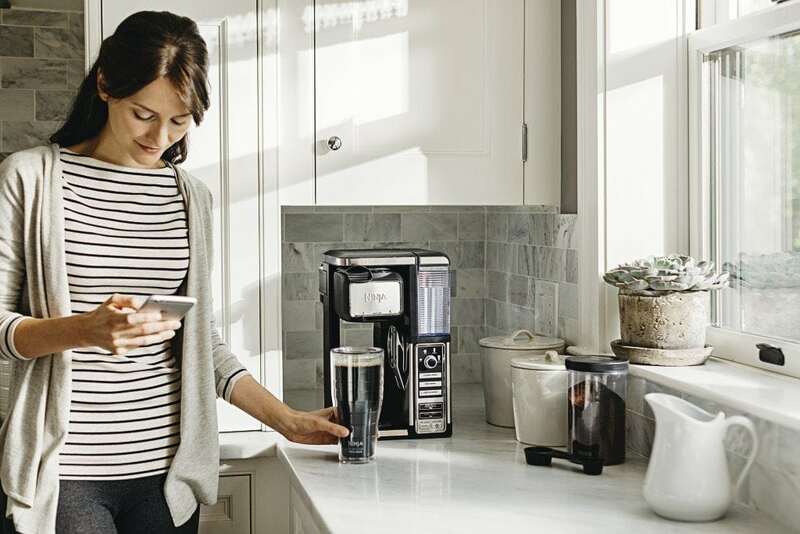 With the click of a few buttons, you’ll have your cup of coffee brewed within a minute, which lives up to the industry standards. We also enjoyed the fact that it has support for brewing tea, cocoa and more. The coffee produced by it also tastes superb. But it came in as number 2 because it’s noisier than most other models on the market. Its buttons also have a cheapish feel to them as if they may be the first thing to break in the future. 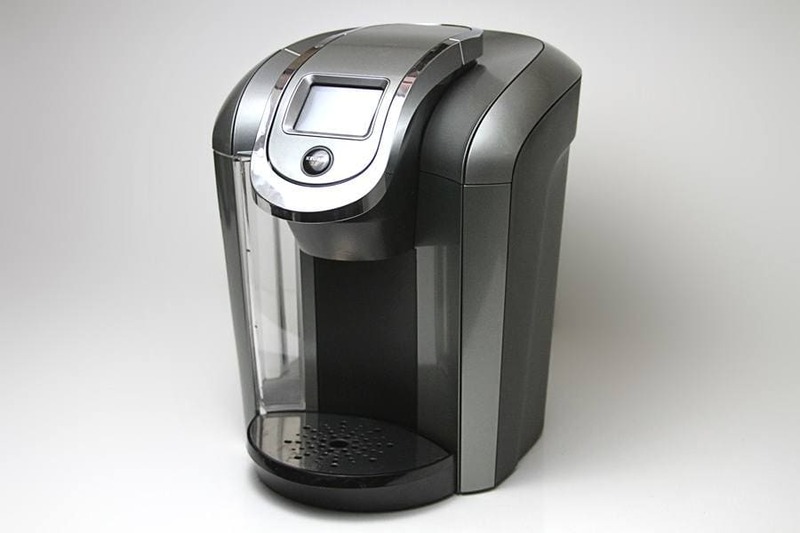 Some users on various coffee forums have also experienced that the coffee produced by their Cuisinart SS-10 splashed when it came out of the maker. Supports adding your favorite coffee grounds. A lot of capacity = fewer refills. Clean with the click of a button (rinse feature). Support for tea, cocoa, and more. Buttons have a cheap feel. Reports of coffee splashing when coming out of the maker. The SharkNinja Coffee Bar CF112 is another fine coffee maker. This model is flexible since it supports a ton of different brew sizes (Cup, XL cup, Travel Mug, XL-Multi-serve etc.). 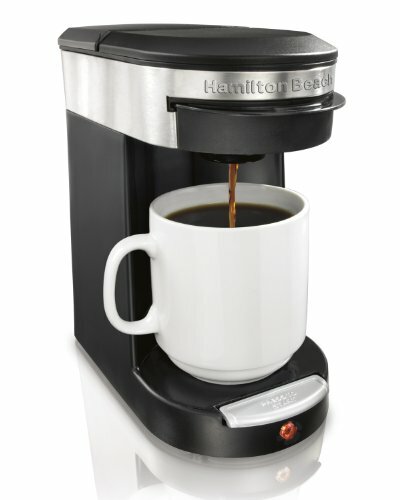 You can also add your own favorite coffee ground as no pods are required for this coffee maker. We’ve found that the built-in milk frother is an excellent and unique addition to this maker. And as soon as you have started using it, you’re not going to want to let go of this feature which is not to be found in many other models. The CF112 also supports a lot of different types of coffee: cold coffee, hot coffee, ice coffee. It’s also possible to make tea and cocoa, but that does require playing a bit with the coffee maker. The variants mentioned above are surprisingly good, and with the recipe book that comes with it, you’re set for some interesting coffee tasting. The downside of this model is that it does not come with a built-in timer. This is a big minus, that’s heavily talked about in various coffee communities. From our testing of the maker, we experienced that it required cleaning much more often than other models, which can end up taking some time on your end on a weekly basis. Also, the construction is mostly made out of plastic which gives it a cheapish feel. It’s also important to mention that the buttons on this maker are hard to read if you have poor eyesight. No pods required, use your favorite coffee ground. A lot of different brew sizes. Lots of different variants: cold + hot coffee and more. Buttons are hard to read with poor sight. 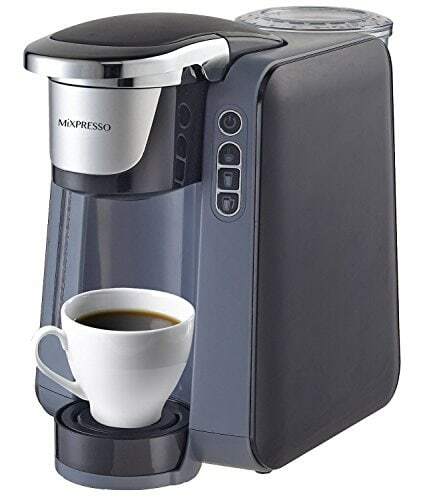 If you want the best bang for your buck, this Mixpresso single serve coffee maker should be your go-to option. It has one of the fastest coffee brewing speeds that we’ve ever seen at 25-30 seconds! Now that’s double as fast as our #1 pick. What we also really liked about this model is that it supports unlicensed K-cups, meaning that it doesn’t have to be a K-cup manufactured by Keurig. It’s also a rather compact machine that’s energy efficient and automatically shuts off after brewing which is a decent feature. It’s also one of the quietest machines we’ve had our hands on, which is one of the factors that makes this coffee maker shine. The downside of this product is that the water container is rather small, and the coffee maker doesn’t even give you a notification when it’s about to run out of water, which is stupid. And in the unfortunate event that your coffee maker breaks down, you’re not going to have much luck with Mixpresso’s customer support, as their customer support is unreliable. BREWS COFFEE FAST: 25-30 seconds! Automatic shut off after brewing. No notification if it runs out of water. The Hamilton Beach 49970 is in its own price range. It’s inexpensive and should only be an option you should go for if you’re on a very low budget. It’s extremely cheap, but the product you get for this price is not that great. The coffee it brews is okay, but not anything special. This is due to the fact that it doesn’t extract enough flavors from the pods which is most likely due to the fact that the water is only lukewarm/tepid. The coffee maker is however easy to use, and when you want to clean it, that’s also rather simple. The Melitta Coffee Pods that it supports and that comes with it are okay. They’re cheap, but it’s no secret that they’re not the best, which adds to the mediocre coffee experience. This also means that you’re not able to add your own coffee grounds which for is a big minus. To conclude: this coffee maker should only be bought if you’re on a low budget. It’s not one of the greatest coffee makers out there, but it should be able to live up to the basic coffee drinker’s needs. Mediocre coffee quality – doesn’t extract enough flavors from pods. There are a lot of factors you should consider when buying a single serve coffee maker if you want to find the perfect one that will fit your needs. In this short buying guide, we will go in-depth into the things that are important to consider when picking a single serve coffee maker. Some coffee makers only support pods, and some of them only support K-pods that are manufactured by Keurig. This limits your options when it comes to how you want to experiment with the flavor of the coffee because all your options are from Keurig. But then again, there are over 500 different variants from Keurig. Most single serve coffee makers have the ability to use ground coffee, which in our opinion is a crucial option. There’s just something about the freshness that you get with traditional ground coffee that you can’t get from K-pods. 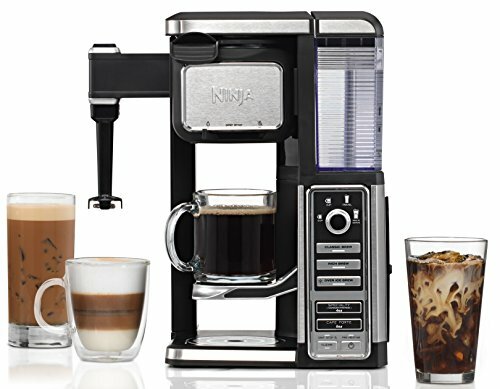 Some coffee makers also have the option to make ice coffee, tea, cocoa and so much more. All depending on your preferences, you should consider if this is important to you. Single serve coffee makers come in various sizes. It’s usually the case that the bigger the machine the bigger the capacity for water and pods/ground coffee. Usually, you’re going to want a big machine with a lot of capacity if it’s a machine that’s going to stand in the office or if you’re a family of coffee lovers. But note that a big machine can also take up a lot of space, and you may not have a cabinet or shelf that’s big enough to store it. But if you’re a small family the smallest models should be fine for your needs. There’s no denying that price is a different factor. When it comes to single serve coffee makers you don’t want to be buying the machines in the lowest price range (around $10-$30). They usually make mediocre coffee at best, and their life expectancy is usually at the low end. Therefore, you want to be careful with those cheap options. They may look great on the outside, but in a long-term perspective, they’re not worth it. But don’t worry, you won’t have to break your wallet just to buy yourself a single serve coffee makers. They’re generally not very expensive compared to coffee machines and espresso machines. We’ve also done the “hard work” for you and selected the best single serve coffee maker which can be found in the reviews above. There are some models that make a lot of noise while there are others that are almost completely silent. Some coffee drinkers think that a loud machine is “attractive” whereas others hate it. It’s all down to preference. Our general advice is to go for a single serve coffee maker that doesn’t make a lot of noise, and there are plenty of them out there. For the real coffee lovers, the ability to fine-tune the brewing is a must. If it’s very important to you, you should consider finding a single serve coffee maker that has that comes with buttons or other ways to control how strong or light your coffee should be. However, most single serve coffee makers already come pre-programmed very nicely, so it’s only something we suggest you look for and play with if you passionate about your coffee. This is all depending on personal preference. For some, the aesthetics are extremely important whereas for others it doesn’t really matter. It’s something that you want to decide for yourself. Some models are more visually appealing than others. Some models look sleek, sharp and impressive whereas others look antiquated, bulky and cheap. It’s completely objective what is aesthetic, so you’ll want to look at the machine for yourself and decide whether it will look great or not in your environment. However, in our opinion most single serve coffee makers look great today, so we would say that you should not think too much about it. If you’re a big family or if the single serve coffee maker is going to be located in an office environment, you should consider looking for a machine with a big tank capacity. With a big tank capacity, you’ll spend less time preparing the coffee and you’ll have more time to enjoy it. But if you’re a small family, a couple or it’s just you, then you shouldn’t pay too much attention to this factor. Single serve coffee makers are especially great if you’re looking for a simple to use coffee maker that won’t take up too much space. They’re also very fast compared to other types of coffee makers. The key to making great coffee lies in the machine itself. Therefore, you should look for a great one that will suit your needs. You should quickly be able to find the perfect one for your needs by reading our popular reviews above, where we’ve ranked the Keurig K250 Single Serve as our top pick.